My Cat Doesn’t Drink Much. Should I Be Worried ? 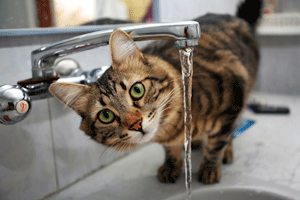 Your cat drinks water, but you’re not sure it’s enough? This is a legitimate question, because serious urinary problems could arise if your pet doesn’t drink enough water. All animals concentrate their urine, but the feline’s renal capacity allows it to concentrate its urine even more than other animals. Your cat therefore has a very high urine density and its urine thus contains more minerals, ions and other harmful substances that have been filtered out of the body by the kidneys. When your cat has predisposing urinary factors, such as poor quality food that is too rich in minerals, or an inappropriate urinary pH, its kidneys send excess minerals to the bladder. These minerals stick together and form sand, crystals or bladder stones. A disease of the lower urinary tract soon follows, along with all of the consequences: inflammation of the bladder or cystitis, acute or chronic disease, bacterial infection, discomfort, pain, difficultly urinating, urinary blockage, death. * Add canned food to your pet’s menu or add water to its dry food. * Your cat prefers to drink directly from the tap. This is possible because we know that cats like moving water. Get your pet an easy-to-use water fountain, which always provides fresh water…very fresh…which cats really appreciate. * Put several bowls of fresh water in different places. * The water bowls should always be full. * Cats prefer bowls made of glass, stainless steel or ceramic, which keep the contents cool. Avoid plastic, which can change the taste of the water. * Each bowl should be large enough so that the cat’s moustache doesn’t come into contact with the edge of the bowl, which cats hate. * Every week, wash the bowls with mild, unscented dish soap and rinse them well. Cats can easily detect a perfumed scent and could avoid drinking if the water has an unfamiliar taste. Keep an eye on how much water your cat drinks. If you have any questions, ask your vet, who will help you make the best choices for your four-legged friend.